Duterte Signs Freedom on Information! 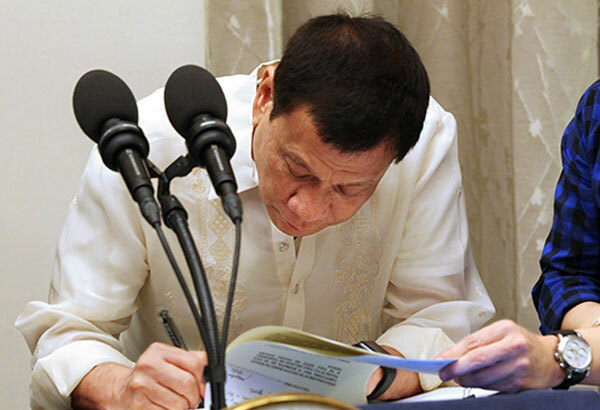 President Duterte signed the Executive Order on Freedom on Information, a landmark executive order after a bill of a similar nature has languished in the legislative mill for twenty-nine years. Presidential Communications Secretary Martin Andanar made the announcement on a Sunday press conference in Davao City aired on government network People’s Television (PTV) 4. Andanar earlier assured that the EO on the FOI will be signed before the President’s first State of the Nation Address (SONA) on Monday, July 25. The Executive Order, entitled “Operationalizing the Executive Branch the People’s Constitutional Right to Information and the State Policies of Full Public Disclosure and Transparency in the Public Service and Providing Guidelines Thereof,” is a campaign promise of then presidential candidate Rodrigo Duterte to make public documents and records more available to citizens and promote transparency in the government. A bill on the FOI failed to muster enough support in the 16th Congress. Any person who requests access to information shall submit a written request to the government office concerned. The request shall state the name and contact information of the requesting party, provide valid proof of his identification or authorization, reasonably describe the information requested, and even the reason for or purpose of the request for information. On the one hand, the public official receiving the request shall provide reasonable assistance, free of charge. Twenty-three days into his presidency, President Duterte’s EO on FOI is a landmark executive order after a bill of a similar nature has languished in the legislative mill for twenty-nine years.